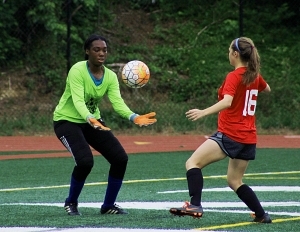 The future of DeKalb County soccer was on display in the DCSD All-Star Soccer matches on Thursday night at Adams Stadium when seven of 11 goals scored on the night were non-seniors. That youth movement this season saw 49 (21 girls, 28 boys) non-seniors get action in the two games consisting of some 100 players out of the district. Coaches took the time to work with the players in practice and continued teaching throughout the games no matter which school the players attended. The patience and work ethic showed as Team Scarlet Red opened the night with a 4-1 victory over Team Turquoise Blue in the girls’ match. Lakeside junior Olivia Cohen, who had 21 goals on the season, struck first for Scarlet Red with 25:41 left in the first half to put her team up 1-0. The score would remain 1-0 at the half as Towers junior Shaheedah Watkins put together five saves playing in net during the half for Turquoise Blue. One diving save on a big opportunity by Scarlet Red helped keep the score at 1-0 heading into the half. Turquoise Blue opened the second half scoring just one minute and 18 seconds into the half as Redan senior Kierra Bankston passed ahead to Miller Grove junior Kierra Eubanks who found the right corner to knot the game at 1-1. DeKalb’s leading scorer this season senior Georgia Anna Sinclair from Southwest DeKalb showed why just five minutes later with a blast into the net to make 2-1 in favor of Scarlet Red. Sinclair struck again with 16:08 to play with another high powered kick to make 3-1. Tucker junior Anna Lippy finished the scoring at the 12:13 mark of the second half to finish off the scoring and giving Scarlet Red the 4-1 advantage. Youth was served in the boys’ contest as well as four of the six goals in Team Black’s 5-1 win over Team White came from non-seniors, including two sophomores and one freshman. Seniors got the ball rolling early though as Tucker’s Thawng Hrang Lung connected with Tucker teammate Aoci Pilipili on the first goal of the night to make it 1-0 in favor of Team Black in the early going. The two teams battled each other and a pair of lightning delays as the half ended 1-0. Sophomores Lavacatus Niyukuri of Lithonia and Hakeem Linton of Towers would score the next two goals for Team Black. Clarkston junior Gezai Eta got a steal and scored the lone goal for Team White. Cross Keys freshman Anthony Maldonado made it a 4-1 game before Lithonia senior Julian Tinoco got an assist from Lakeside senior Saul Tinoco for the final margin of 5-1. 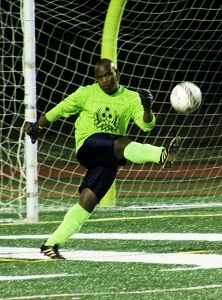 Stephenson senior Austin Brown was named Team Black’s Most Outstanding player for his play in goal. Eta was named Team White’s Most Outstanding Player.